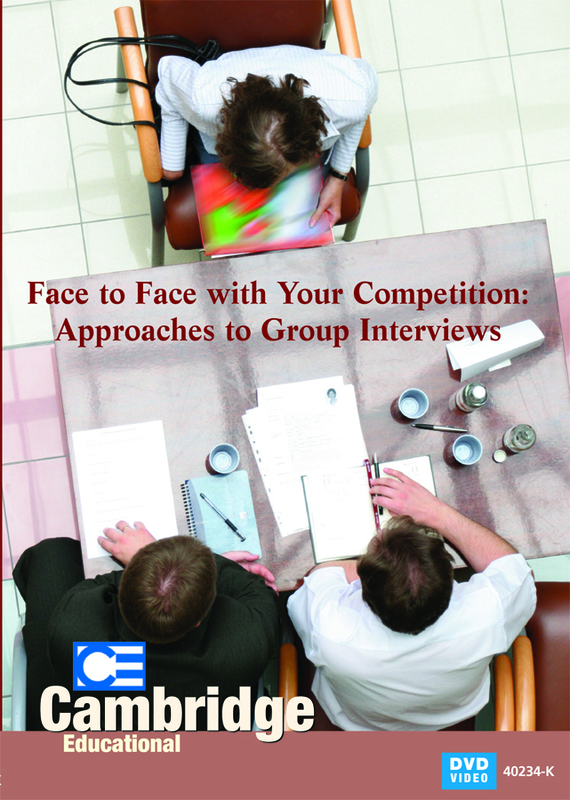 This DVD goes into detail about strategies for approaching group interviews. Group interviews show employers how applicants work together in teams and often require job applicants to work together to solve a problem or on a shared exercise. Group interviews are more commonly seen because companies want to see how applicants collaborate and their communication skills. This program goes into detail about how applications should prepare for group interviews. It includes group case studies as well as one-on-one interview case studies to show the differences between them. It also explores the various parts that a typical group interview will have such as the introduction and icebreaker, assessment, group activity, and the closing. The program also explores how facilitators are involved with the interview process and their purpose. Educational resources that can be viewed on the internet are included with the program. Group Job Interviews: New Perspective (02:33) � Employers observe how applicants complete tasks and interact with each other as they solve problems. Preparation for Interviews: One-on-One and Group (05:08) � Applications prepare to answer questions about their background and suitability for the role, and they research the company. Group Interview in Session (03:51) � Group interviews can include up to 50 people, and a facilitator starts the interview while others rank the candidates. Group Interview Activities (03:09) � An icebreaker may be included in the interview as a way to ease up social tensions. Group activities show each candidates strengths such as leadership and organizational skills. Group Interview Assessments (03:33) � Assessors make their observations and an individual assessment is used to test other skills. Value of Group Interview (04:13) � The group interview can be valuable for applicants and help with personal development.